After 7 releases and 4500+ downloads, this project will close its doors on the new year’s eve. If you are looking for a project which will survive beyond December 31st, please move on, this is not it. I once again would like to thank all the people who have shown interest, all the seeders of the torrent files, and the translators. Everybody is welcome to download the source code or the iso files until I unplug this server. So long, goodbye. ComixWall installation is very intuitive and easy, just follow the instructions on the screen and answer the questions asked. You are advised to accept the default answers to all the questions. In fact, the installation can be completed by accepting default answers all the way from the first question until the last. The only obvious exceptions are network configuration and password setup. Auto allocator will provide a partition layout recommended for your disk. Suggested partitioning should be suitable for most installations, simply accept it. Make sure you configure two network interfaces. You will be asked to choose internal and external interfaces later on. All of the install sets and software packages are selected by default, simply accept the selections. If you are upgrading, you will notice that a few packages are deselected. However, you are advised to include them among the selections by hitting ENTER a couple of times. If the installation script finds an already existing file which needs to be updated, it saves the old file as <filename>.orig. To update all such files, accept the default ‘a’ answer when asked. Installation logs can be found under the /root directory. You can access the web administration interface using the IP address of the system’s internal interface you have selected during installation. You can log in to the system over ssh from internal network. Web interface user names are admin and user. Both are set to the same password you have provided during installation. See http://openbsd.org/amd64.html and http://openbsd.org/i386.html for supported hardware. See http://openbsd.org/faq/faq4.html for OpenBSD installation instructions. 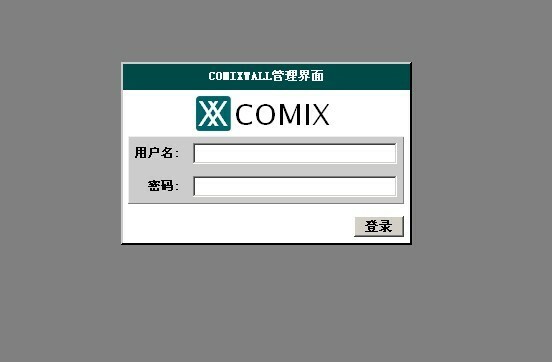 ComixWall Installation CD, the iso image of which you can download using the torrent file on the downloads section of the project web site. Since ComixWall is developed on OpenBSD i386 and amd64 architectures, you will need a 32-bit or 64-bit COTS computer. You may want to see http://openbsd.org/i386.html or http://openbsd.org/amd64.html for supported hardware. The first phase is the usual OpenBSD installation. During OpenBSD installation, make sure you have selected all install sets listed, including siteXX.tgz. ComixWall uses the install script in bsd.rd. There is no point replicating the nice descriptions in OpenBSD guides, so please read http://openbsd.org/faq/faq4.html and follow the instructions there. ComixWall 4.5 installation CD supports upgrading from version 4.4. Therefore, if you already have ComixWall 4.4 installed on your system, you can choose upgrade mode at the beginning of OpenBSD installation. /var partition will contain logs, so keep it as large as you wish. Also, do not omit the network configuration phase and enable the DNS during OpenBSD installation, because the network may be used to set the clock via a time server. ComixWall web interface users are ‘admin’ and ‘user’. Both passwords are ‘wwwcomix’. When OpenBSD installation is complete, installation jumps to ComixWall install.site or upgrade.site script, depending on the method you have chosen at the beginning of OpenBSD installation. Installation scripts in ComixWall are heavily modified versions of the scripts in bsd.rd (especially install.sub), but the basic operation and principles are the same. Welcome to the ComixWall install program. Hit ‘y’ to continue with installation. If you are sure the hardware clock is correct, just hit ENTER here, but it is wise to set the clock during installation to avoid hops in time in normal operation. If you have copied packages to a supported location, you can of course choose accordingly, but if not, just hit ENTER here. In most cases you want to hit ENTER here to start automatic installation of all the available packages. Otherwise, you can de-select packages you don’t want installed. However, you are strongly advised to select all the packages at this point (by entering 鈥渁ll鈥?here). If not, you will need to manually upgrade your configuration files, and this may be a harder task than letting this configuration script install the new configuration files. If you hit ENTER here, thus choose no, the new configuration file will be copied to your system with .new extension, as follows <filename>.new. If you enter yes, the old file will be renamed as <filename>.orig, and the new file will be installed. When the system resumes normal operations, you will need to compare the original and new files and merge your custom changes as necessary. If you enter all, yes reponse will be assumed for the rest of the files. at least the first Interactive phase. If you entered the correct hostname you want to use for ComixWall during OpenBSD installation phase, then just hit ENTER, or type in a new one. Next you have an option to change interface configuration which you should have already completed during OpenBSD installation phase. If you don’t want to change anything, just type ‘done’. The final two steps of the manual phase of the first install configuration are instructing ComixWall to use which interface as LAN or WAN. You should select the correct physical interface name for LAN among the options (fxp0 and nfe0 here are just sample names). And select the WAN interface too. At this point manual part of the first install automatic configuration is done, and you will see many lines scrolling by on your screen. You can restart or type ‘done’ to exit. If you think you want to change some settings, you can go back to the beginning of the manual configuration steps. ComixWall configuration script tries to guess the DHCP server IP range using the LAN network address. 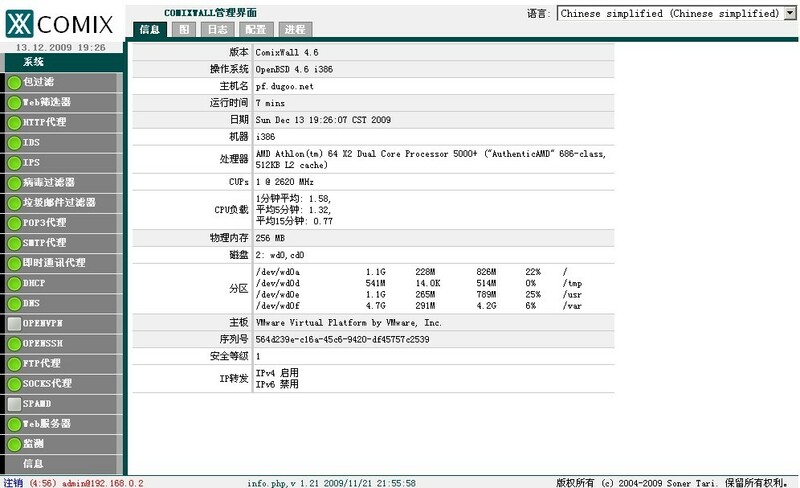 For example, if your LAN network is 192.168.1.0/24, the configuration script chooses 192.168.1.1 鈥?192.168.1.254 as the IP range. You can modify this range on the web interface. CONGRATULATIONS! Your ComixWall install has been successfully completed! At the command line type ‘halt’ as instructed, remove the installation CD from the drive. Hitting a key will reboot the system for normal operation. Since there are dependencies between some packages, you are strongly advised to install all available packages. If not, you may need to manually change some configuration. You can name your system as you wish, but you are advised to use an FQDN.